Recreate the traditional taste of the holiday season all year round with our Classic Brown Gravy Mix. Perfect over mashed potatoes or any of your favorite gravy recipes, like Knorr Saucy Swedish Meatballs. Classic Brown is rated 3.6 out of 5 by 8. Rated 5 out of 5 by Elliemcw from Green peppercorn gravy I've always loved all of Knorrs products ! Dips , side dishes , sauces and gravies..... Question is why can't I find Green Peppercorn Gravy any more? Here in Pennsylvania in the Philadelphia area we can't find it anywhere. I've asked grocery managers in many stores if they could get it in and they all say they can't get it anymore. I'm wondering why this is since it's such a delicious gravy and sauce. The only place I have found it is on Amazon for $14 for a packet as much as I love it that's a little much with the lender. Why isn't it in the stores anymore? Hoping you can help me out . Rated 5 out of 5 by scrooge from ya Exactly what I was wanting. Gos good with just about anything. 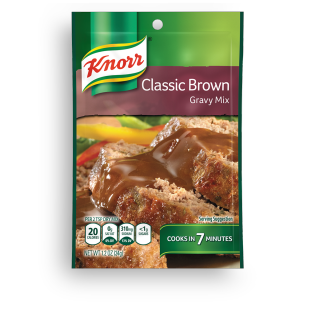 Rated 5 out of 5 by OpaThe Grand from Best Gravy Ever For years I have garnished my meals here in Southern California with Knorr's Classic Brown Gravy and loved it. For the past two years or so, this product has been disappearing from our grocery shelves. My daughter who lives in Pennsylvania has no problem obtaining it in her area. What's happened to my beloved gravy?